Nine eggs rest on a base of tree. Three of marble, rounded and complete. Three of bronze, incomplete, composite, and raw. Three are halved, like a concave shell of bronze. Together, they lie in rows, three and three, and create a pattern or a series of columns. This is a sculpture by Camilla Nielsen (born 1972), made in 2003 in Canada, where she was studying at Nova Scotia College of Art and Design. The sculpture at Nuuk Art Museum is made out of bell bronze. The three half eggs produce a fine and clear tone when hit. The piece actually includes six more half eggs, which unfortunately are not part of the museum’s collection. 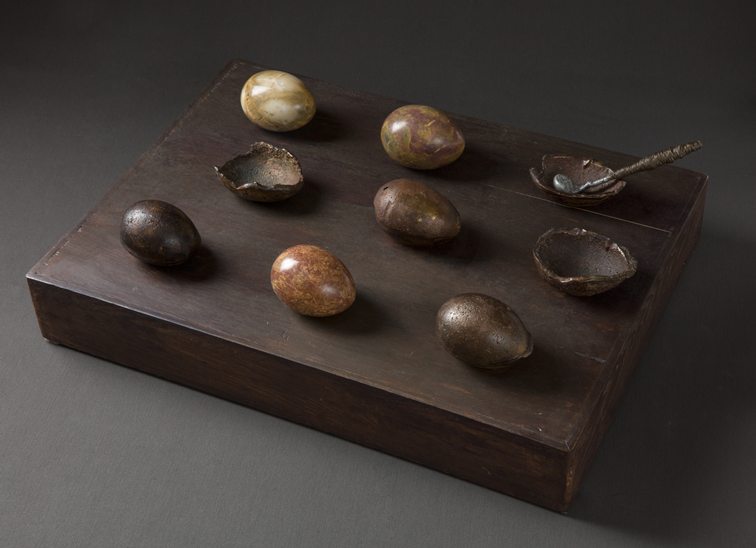 The sculpture was part of a sound installation with mussels, where these eggs were played in combination with sounds of the ocean and Miki Jacobsen’s voice. It was part of the exhibition Indre Strømninger [translates roughly to “Internal Currents”, ed.] at Nuuk Art Museum in 2007, where Camilla Nielsen and Miki Jacobsen exhibited together. The sculpture’s origin can be traced all the way back to Camilla Nielsen’s time at Nuuk Art School, now Greenland’s Art School, in 1996-97. There she made the first sculptures able to produce sounds and noises. Another aspect running back and forth throughout Camilla Nielsen’s art is the interaction between on the one hand the finished, round and soft, and on the other hand the raw expression. The same motives appear repeatedly in her artworks, which she elaborates exactly through repetition. The egg is a figure frequently repeated in her art, for instance. Nielsen underlines that there is no symbolic meaning behind the fact that the pieces in the sculpture are nine, or that they are sorted by three; rather, she wanted to explore the material: what would happen when you combined stone and bronze in such different membranes. Other motives that Nielsen continuously repeats, processes and explores are the fish (especially the redfish) and mussel shells. In the process of repetition and elaboration, the egg, fish, and mussel become all symbolic of something else. They point to form, process, and material, rather than to the motive itself. In her paintings, Camilla Nielsen works with acrylic paint, watercolor, and India ink on top of each other. One such painting is exhibited at Nuuk Art Museum, in which she additionally worked with chalk. Camilla Nielsen does not work with sketches or from anything fixed. The painting in Nuuk Art Museum’s collection is without a title. It dates back to a period when she used to work a lot with smiley faces and reflect on how the mind works when we see three dots – how much the mind constructs compared to how much is actually there. The painting without title is a sidepiece to a series of twelve, included in the Kimik’s (the association of Greenlandic Artists) exhibition hold when the new exhibition area of Nuuk Art Museum was opened in 2007. The oval head and the three dots provide a foundation on which to add and work with different color combinations. Again, this is a process of exploring the material and repeating a motive. The painting is dominated by blue and orange-red. A pale oval with three big and slightly smeared dots is located near to the middle of the painting. The picture is painted with broad and expressive brush strokes, each of them carrying not just one color but many; in each of these strokes one can sense the layered construction of colors. Aside from the untitled painting, Nuuk Art Museum owns three graphic works by Camilla Nielsen in which she placed a three dimensional item on top of something two-dimensional. The three pieces are part of a series of 22, which was also included in the exhibition Indre Strømninger. The graphic pieces are built up as a concentric system of frames, encasing inner spaces like boxes. Starting from the outside there is a silver frame, thereafter the passe-partout, the edge of the paper that the piece is printed on, then the actual print, and inside the print there’s a photo. A rectangular shape is repeated from layer to layer. All the three photographs show material three-dimensional works: one of a smoothly polished face in a raw mass; another of a smoothly polished raw stone; a third of an opened book on a stand. As the framing proceeds layer upon layer, the photographs become part of the same process and the motive ends up pointing to something else than itself. The stone in the photography is called “Tension” and has a double both in the three-dimensional physical world, and in the world of graphic art. These 22 different graphic works are not necessarily thought of as one big art piece though, as according to Camilla Nielsen they can just as well exist on their own and as a collection. The photographs are circled by a colored frame crossed by wavy lines that grow from below: it is the artist’s own hair, winding up through the image. The graphic technique employed is called chine-collé: a thin layer of Japanese paper is attached to a thicker motherboard before printing; then printing is executed with a copper plate that the hair had been etched in and has subsequently been colored by hand.